Origin and Habitat: Western Texas, southeastern New Mexico, and northern Mexico. Type locality: About El Paso, Texas. Altitude: 1200-1600 metres above sea level. Habitat: It grows on arid areas in igneous and sedimentary soils, that usually are more arid than is typical for the related var. cylindricus. 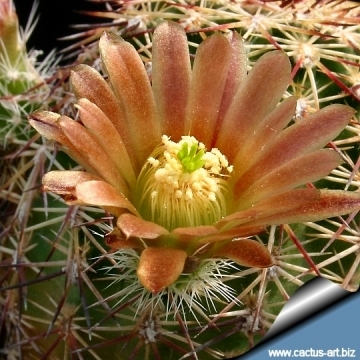 It is often found growing along with Coryphantha vivipara. 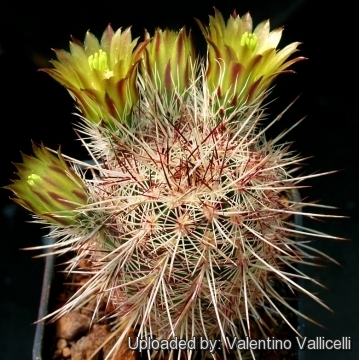 Description: Echinocereus viridiflorus var. 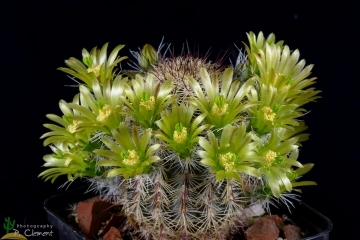 chloranthus is somewhat like Echinocereus viridiflorus, having similar small flowers. 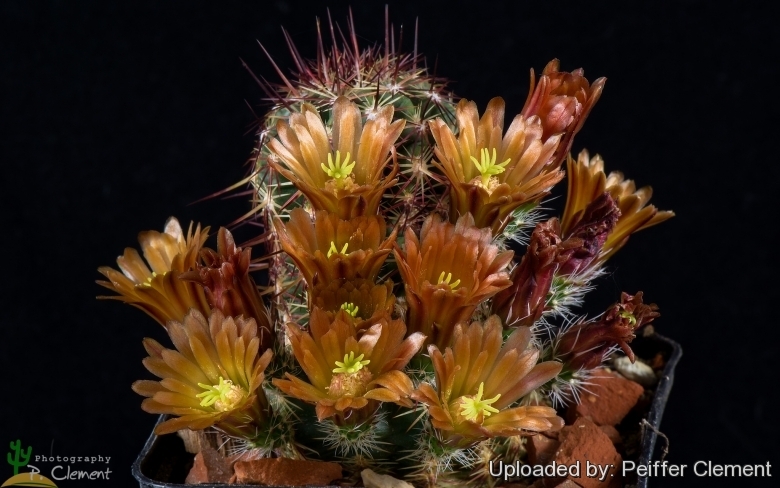 It is usually more elongated, with a bristly appearance, horizontal colour banding, longer and curved lower central spines and with the flowers appearing lower down on the plant, generally below the middle. In habitat this plant integrates with Echinocereus viridiflorus var. 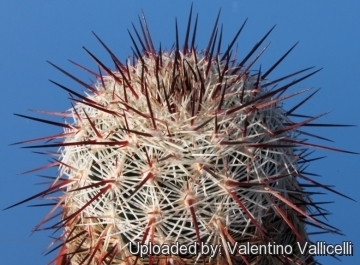 cylindricus (fewer central spines) and Echinocereus viridiflorus var. 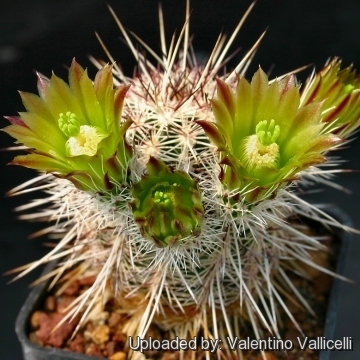 russanthus (more central spines) and it is very difficult to distinguishes it from its relatives, generating more confusion among cactus fanciers and grower about it than about any other Echinocereus species. 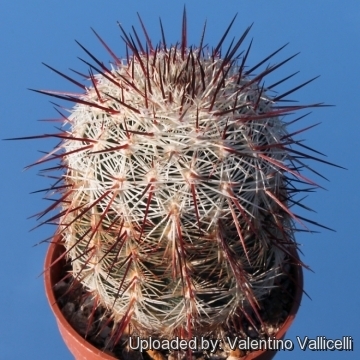 Moreover at a first glance, if not in flower, it may be confused with Echinocereus dasyacanthus. Habit: It is usually simple or branching, but older plants may exhibit limited branching with as many as 10 or more branches. Stem: Cylindrical, erect, pale green, 7-15(-25) cm long, 5 to 8 cm. in diameter. Ribs: About (10-)11-16(-18), often nearly hidden by the densely set spines, well defined, undulate, and tuberculate, at the areoles with shallow furrows between the ribs and the tubercles. Areoles: Nearly circular, or elliptic to oblong and 3-4 mm long, and 3-6 mm apart on the ribs. Only areoles near the stem apex have copious short white wool. Floriferous areoles remains as persistent conspicuous tuft of wool even after the flower or fruit has fallen. Central spines: (2-)3-4(-6), not angled, straight, 6-20 mm long, when they number two or three, they are positioned in a single vertical row otherwise, they spread in all directions, usually reddish (Rarely cream or yellowish), the lower one often curved, much more elongated than the others, usually white, somewhat translucent, although often with a reddish tip, and up to 20-30 mm long. In juvenile plants the central spines are more slender than in adults and may be absent or present. Radial spines: Several (15-23 or more), tightly appressed, evenly radiating around the areoles or slightly spreading, 12-14 mm long, the upper 4-6 of them often shorter and weaker, never hairy, quite variable in colour even in different areoles on the same plant, ashy white, cream, grey, reddish, or reddish black, or even variegated often with darker distal portions or tips and forming horizontal bands around the stem. In juvenile plants the radial spines are short, pectinate, and appressed, except in turgid seedlings, where the radials may be spreading. 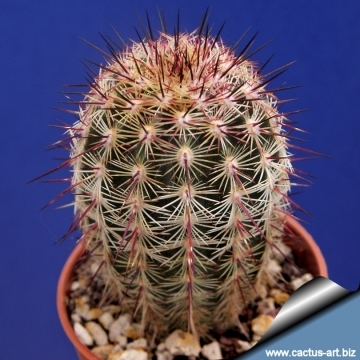 All the spines has a bulbous base but usually covered, until they are very old, by the wool of the areoles. Flowers: Produced on lateral midstems, but sometime lower, funnelform, not opening widely, 20-34 mm long, dark green, yellowish green, bronze-green, brown or dark chocolate-brown, 2 cm. long. Usually unscented. Ovary with white wool and white spines about 6-12 mm long. Inner perianth segments 2,5-5 mm wide, not broadening throughout their length brownish-green or rusty and greener toward the center, often with dark green midlines with the margins lighter green and suffused with brown, tips acute-apiculate, rounded, or even emarginate. Outer perianth segments often with brownish midlines and margins olive-yellow. Filaments pale yellow or greenish. Anthers cream coloured or yellow. Stile greenish, 1,2-2 cm long. Stigma lobes 8-10 dark green. Blooming season: Spring for 15-30 days. ( in habitat from March through May). Individual plants or stems may produce more than 30 flowers at a time. Fruits: Small, nearly globular, 5 to 17 mm long, green (or dull purplish red), indehiscent, covered with small bristly spines, that easily fall away, leaving a glistening fruit wall. Seeds: 1-1,3 mm long and broad, black, dull, papillate (pitted), the hilum nearly basal, round. 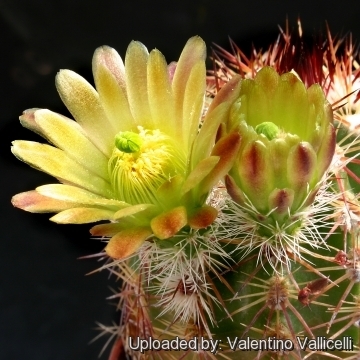 Notes: Echinocereus chloranthus is part of the Echinocereus viridiflorus complex that comprises a large number of infraspecific taxa, differing in various combinations of flower color, spine color, number and thickness of central spines, and other characters, including floral scent. Wherever such taxa are sympatric they intergrade; all are freely interfertile in the greenhouse.